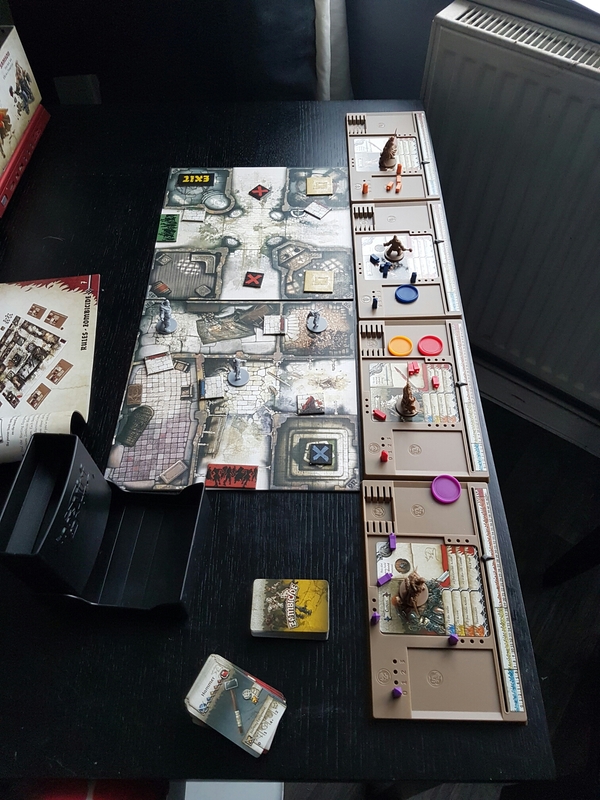 I thought for something cool and different to do I would play through the campaign of Zombicide: Black Plague and see how well I could turn out a turn by turn battle report so here goes. My four worthy adventurers for Danse Macabre are Clovis with 2 short swords, Baldric with a short sword and mana blast, Samson with a hammer and Silas with a short bow, lets see how long it takes someone to get eaten. Starting off turn one Clovis searched the starting area and found a torch, in a fit of rage at finding such a seemingly useles item he turned and smashed a door in which revealed the blue objective that he entered the room to get. (In writing this I have just realised I took an extra two actions in game so I had best rewind him for turn two) Opening a door drew a zombie card which was a Double Spawn so next time I will be drawing two zombie spawn cards! Baldric searched the area and found an axe, I mean what self respecting wizard is without an axe, seriously,he then forfeited all other actions as he was trying to pick up the axe as it was a bit to heavy for him! Silas took aim and let fly with an arrow at a Walker and BAM one less flesh eating mindless monster to look out for and swiftly moved up a section and searched the area to find the most useful thing possible, some apples! Not to be outdone and forgetting the double zombie Spawn effect still lingering in the air Samson followed Silas tripped over a sword which he picked up and stoved another door down drawing two zombie spawn cards gave me a Walker and a Fatty in the room, could my luck go any further south! The zombies shuffled towards my band of hapless cleptomainiacs and a walker spawned at the red spawn zone, brilliant more targets! Moving into turn two and its at this point I realise the door Samson stoved in cant be opened until the objective has been taken so rewind to turn one and have Baldric reuse his to missed action to pick it up and everything is hunky dory! Clovis moves, searches the area and finds another torch. What am i supposed to do blind the zombies to death? Then moves forward to hopefully form a rear guard for the group! Whilst Baldric runs to catch up and sees a walker unleashes a torrent of Mana at it and singing the over hanging balcony. Seeing the spectacular flaming balcony Silas lets loose with an arrow at the same time and nails the zombie in the head before diving into the newly opened room to engage the walker and misses. Samson follows Silas in and lets fly with his hammer, missing the fatty and obliterating the walker. Turn two for Zombies sees the Fatty hit Silas for one damage and no walkers spawn, so looks like my luck might be changing! Turn three starts with a fearless Clovis charge in past Samson and Silas to take on the Fatty which he cuts to pieces easily with his dual wielded short swords. Using the torch he previously found Clovis has a look in some of the darker corners of the room and comes up with a sword and an axe, he passes the ax to Samson. Baldric moves to catch up with the group gives Samson his axe as well and then searches the room to reveal a speed enchantment. Turn three is shaping up quite nicely even if am still on the first board section. determined to try out his new axes Samson lets fly at the closed door, and using four dice and needing only a 4+ to disintergrate the door…..well lets just say we arent going to need a carpenter just yet so Samson gives a sword to Clovis! Loath to open the door to the fatty outside Silas just hunts round the room whilst eating some apples to get his health back and finds some chainmail armour which he gives to Clovis. During the Zombie phase one walker appeared at the red spawn, I am wondering if it would be a good idea just to go and pop an arrow in its skull. Turn 4 starts with Clovis determined to show Samson how to open a door using weapons. With the door successfully turned into kindling Clovis charges the lurking Fatty and in a fit of frenzy turns it into undead kebab meat! Baldric strides forward two spaces and smashes open another door with a sword proving that Samson is the most useless member of the team, but in doing so introduces the team to its first runner and an accompanying walker that spawns alongside it! Never fear though as Silas strides down the street and launches two lots of arrows pinning both the runner and the walker to the back wall of the hovel in an exquisite display of marksmanship. Samson just skulks along, presumably with an embarrassed look upon his face, for the ride! The zombie Spawn sees a Fatty entering the fray to chase down our illustrious crew (and Samson). Moving swiftly on because we know there is a fatty behind us, Clovis makes a run for the trap door with Baldric, although Baldric has to blast the vault door open with magic, which causes a walker to appear in the other room. Silas runs to follow but notices some bolts laying on the floor which he picks up. Samson, humiliated by his lack of combat prowess so far charges through the trap door to engage the walker on the other side, neatly severing the walkers head, maybe not so useless? The zombie spawn hands out a double spawn. The chase is on. Clovis runs through the tunnel, deflty hacks at the door, drawing two spawn cards; a walker and a fatty, after this he searches the room and finds some dragon bile, sweet! Baldric follows and other than opening the door does the same to receive some whilst Silas finds some salted meat. He is going to look the size of a fatty at this rate! Sampson charges through towards one of the objectives, he is useless and needs to get some experiance. The zombies lurch forwards and thus ends this turn. Two more turns and I should be done from this point. Clovis runs forward to attack the advancing zombies with his duel wielded shiny swords four dice, three hits will clear the way. Two hits the fatty is gone, Baldric throws his crossbow to Silas and runs in sword swinging to eviscerate the walker and finds a dagger in the remains. Silas runs around Clovis to get an objective which not only allows the last door to be unlocked but also gives him enough experience to go up a level getting a 4th activation which he uses to equip the Crossbow. Samson flips up the last objective and moves towards the centre ready to face down the final onslaught of zombies that securing the green objective is going to trigger! Which disappointingly is a single walker! With only a walker and a locked door between our heroes and escape Clovis charges the Walker and then turns the door in to splinters triggering one of the last zombie spawns of the game, a runner. Looks like we will be going for another turn. With not much in the way of hand to hand skills Baldric and Silas just hang back and search finding an invisibility spell and leather armour respectively. Samson however charges in to engage the runner killing it outright before it can react to the door opening. With Silas now at the next experience level the zombie spawns are going to get harder, first one is a runner, the second is 2 Walker right next to Clovis who starts the next turn by swinging confidently at the two newly appeared walkers smashing them both to the ground and gaining an experience level. In to the room and the exit portal he dives followed by the other three survivors for a successful introduction to Zombicide: Black Plague.